The Proto-urban site of Sarazm comprises the archaeological site of the ancient city of Sarazm. About 5000 years ago it was "the largest metallurgical center of Central Asia engaged in export". It was abandoned after the arrival of the Indo-Iranians, around 2000 BC. Visited this site in September 2018 as part of weekend trip to Tajikistan. It took approximately 3 hours to cover 250 km through picturesque Zaravshan river valley (nomination for 2020 as part of Silk Roads: Zarafshan Corridor) to the site. 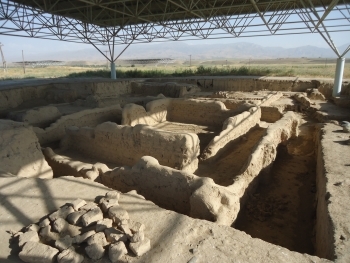 Sarazm was already inhabited over 5,000 years ago (and this lasted for 1,500 years) and is one of the most ancient cultural place on the earth. It doesn’t look much remarkably: there are five covered archeological digs with clay structures. I was trying to identify the place with round structure looking very similar to small Roman theatre located in Excavation V (this view is featured in a number of old photos as the postcard of the site), but currently there is nothing left resembling this structure, probably it was covered with clay for preservation purpose somehow. The site was discovered only in 1976. Tiny on-site museum has some basic finds and photos of presidential visits to the site. Going back to Dushanbe I also visited ancient Penjinkent ruins, where many Sogdian frescos were found (and moved to Saint Petersburg’s Hermitage). As per the guide, more frescos were identified on-site by the recent dig-outs; they have been conserved and will be unearthed during next season. Site visited in July, 2017. 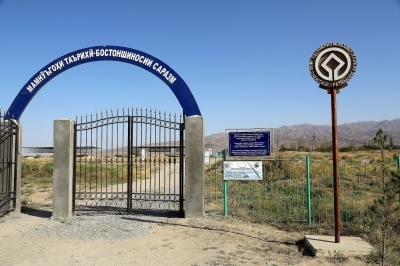 Located around 2 km from Sarazm village, 14 km from Penjikent, north-western part of Tajikistan. There is no direct public transport to the place, although there are marszrutkas from Penjikent to Sarazm village (not very frequent, mostly in the morning). The most convenient way to get there from Penjikent is to take a local taxi. Standard fare for such a trip is around 20 somoni (one way) plus 10 somoni for waiting time on the spot. The whole area is fenced and can be visited free of charge. It consist of 5 excavation places, all covered by steel roofs for protection. In fact apart from walls measuring up to 1 meter high there is not much to see but have in mind that the city is 5500 years old. Small museum located nearby was closed during my visit, probably there is much more to see in the museum in Penjikent. 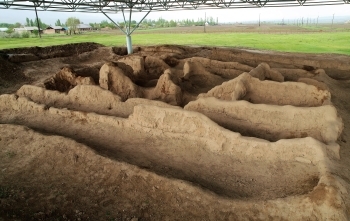 The site is pretty similar to Shahr-i Sokhta in Iran (similar semi-desert location, comparable age and material used for construction) althouhg the latter one is much bigger and by far better exposed and prepared for visiting (visitrs centre, plaques, walking paths, tables with English description). The ancient site of Sarazm is to be found about 15 kms west off Penjikent in north-western part of Tajikistan. Travelling from Dushanbe, it takes about 4-5 hours to reach Penjikent and let me tell you, even though you might think otherwise, that's one of the best roads to be found across the country. The site itself is well-marked, behind a small fence and the excavations are protected by a roof. Some basic information is provided, but not very much. Info booklet can be bought in the Rudaki museum in Penjikent. I really missed a local tour guide here who would give us some context of the culture and the excavation works, as, for example in Cattalhoyuk in Turkey. Some of the artifacts that have been excavated from the ancient Sarazm can also be found in the Rudaki museum, so I'd recommend visiting that first.